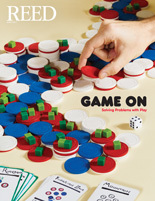 MindStorm draws leading technology companies to Reed to pose their trickiest business challenges to students. It’s an opportunity for students to get a look at the industry—and for the tech companies to get a look at potential recruits. Across the room, Reedies huddled over a set of data on Washington public school students. Andrew Barker of data analytics firm Tableau (which employs no fewer than eight alumni) tasked the group with finding clues in the dataset to how to help low-income students succeed. They were looking for outliers: students whose life stories suggest they might perform one way, but who actually perform another—exceptions to the rule. In the the next group over, five students worked on a puzzle slightly less technical but no less technological: how to convince skeptical media outlets to write about an athletic-performance-enhancing headband. The device, which looks like a pair of designer headphones, delivers low levels of electric current through the cranium to the wearer’s brain to improve performance gains during training—or so the device’s developer alleges. The first problem for the group? Figuring out which press narratives about the device the PR firm should avoid. “Danger. Potential danger,” suggests theatre major Michael Frazel ’17. “Blindness. Or your head falling off,” Emily Barr ’18, the econ major of the group, adds. “Really, any kind of health risks,” says Caleb Codding ’18, another theatre major. Physics grad Julia Selker ’15, a public relations professional, took notes on the whiteboard. Selker made the trip back to Portland to host the discussion and look for potential recruits on behalf of her San Francisco PR firm, the Bulleit Group. “I want more Reedies to work at my company,” she declared. Reed has an outsized footprint in the world of tech, especially in Portland. Reedies are behind projects such as Puppet Labs, Urban Airship, Switchboard, AppFog, Rogue Ventures, Pickle, Globe Sherpa, and Lucky Sort, and reliably win the coveted Demolicious Cup. Roughly ten percent of Reed’s working alumni hold jobs in the field of computer technology and the college has recently announced a new initiative in computer science. 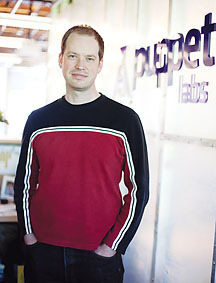 Kanies started Puppet Labs, a company that develops automation IT software, in 2005. Now valued at over $600 million, Puppet towers over Portland’s tech scene and in many ways blazed the trail for the city’s current proliferation of homegrown tech that investors have come to call the Silicon Forest. When it comes to his belief in Reedies’ affinity for the tech industry, Kanies practices what he preaches: he says that about 5% of Puppet Labs’ 420 employees are alumni. The Center for Life Beyond Reed shares his belief. Assistant Director Brooke Hunter says that CLBR has hosted alumni working in the tech industry at schmoozes, Working Weekend, and other events for years, but never had a strategy for connecting students directly with tech companies that are recruiting. Tasked with bringing companies to campus and displaying student talent, Hunter had a realization: “When are Reedies at their best? When they’re solving problems.” Thus MindStorm was born. Reedies have found their way into the tech industry in myriad ways, each with their own twists and turns. “My thesis was what launched my career,” said Gina Collecchia ’09. Collecchia wrote her math thesis about music information retrieval, or, more specifically, how to use math to analyze the composition of the Beatles’ oeuvre. After graduation, she earned her master’s degree in music, science, and technology at Stanford; interned at Apple and Sennheiser; and published a book on musical signal processing. She now works as a research engineer at audio recognition company SoundHound in San Francisco. MindStorm helped students make connections between their passions and potential career paths in the tech sector the same way. When the problem solving sessions came to a close, Barr used her economics knowhow to explain the complexities of pricing brain-stimulating headphones, and Frazel drew on his theatre classes to deconstruct the narrative the PR group was trying to feed the press. “A real-world form of conference,” Frazel added. And the conference leaders of MindStorm were impressed with their students’ discussions.